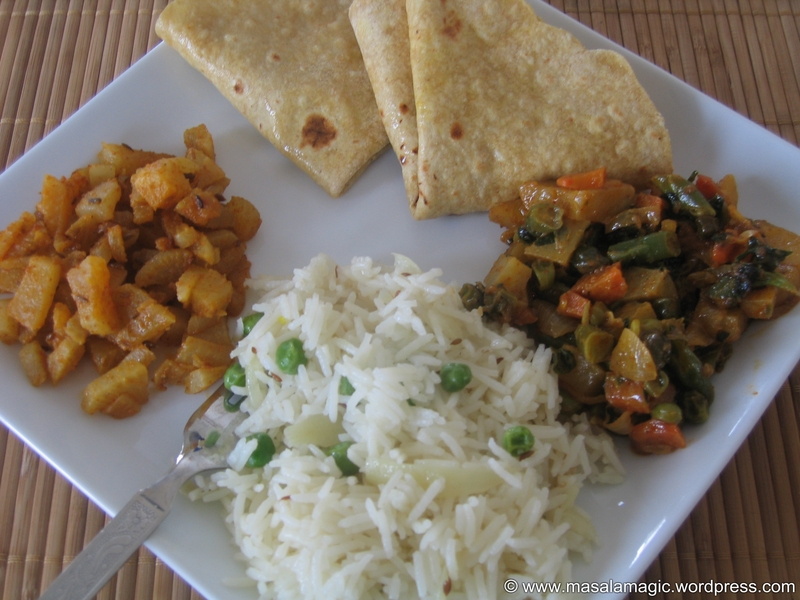 On the menu today, a simple North Indian fare… Phulkas or Rotis with Radish Sabji (Mooli ki sabji) , Kadai Vegetables and Peas Pulav.. very simple and wholesome. Method: Soak about 2 cups of basmati rice for about 15 minutes. 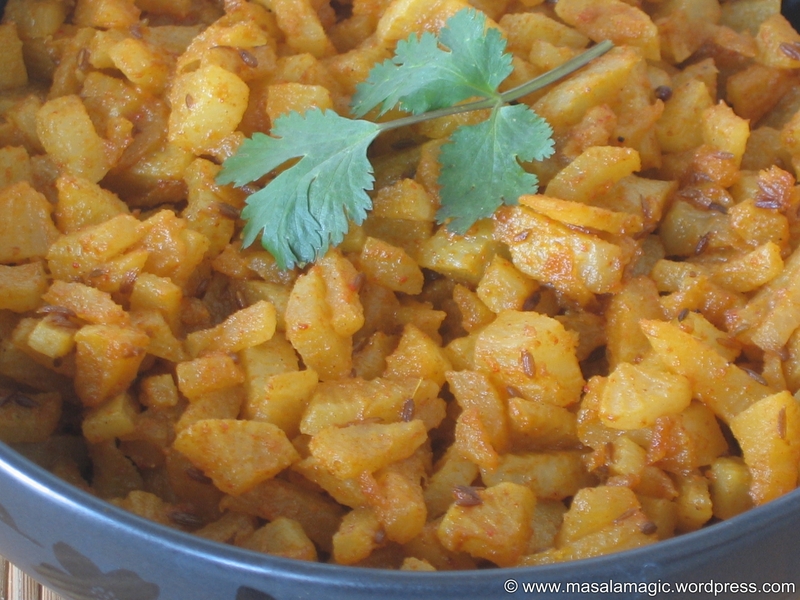 In a heavy bottom pan, heat 2 tbsp Ghee (clarified butter) or oil. Add 1/2 tsp cumin seeds, 1/2 chopped onion (optional), 1 tsp ginger-garlic paste (optional), fresh green peas. Saute for a few minutes. Add the soaked, drained basmati rice. Add salt to taste and fry for about 5 minutes. Mix well. Add 4 cups water, cover with a lid and cook until rice is done on low heat. Serve hot. Tender Radish – 3 cups (I used tender white radish that i bought at the farmers market.) Peel, wash and chop into cubes. Method: Again, a very simple recipe. Heat the oil in a pan, add cumin seeds. Add the chopped radish and saute for 2 minutes. Add all the powders and mix well. Saute for about 3 to 4 minutes. Add 1/2 cup water. Cover with a lid and cook until well cooked. Garnish with chopped cilantro and serve hot. Mixed Vegetables – 3 cups (I used Potatoes, carrots, beans, peas.) Peel/Destring, wash and chop into cubes/small pieces. 1. 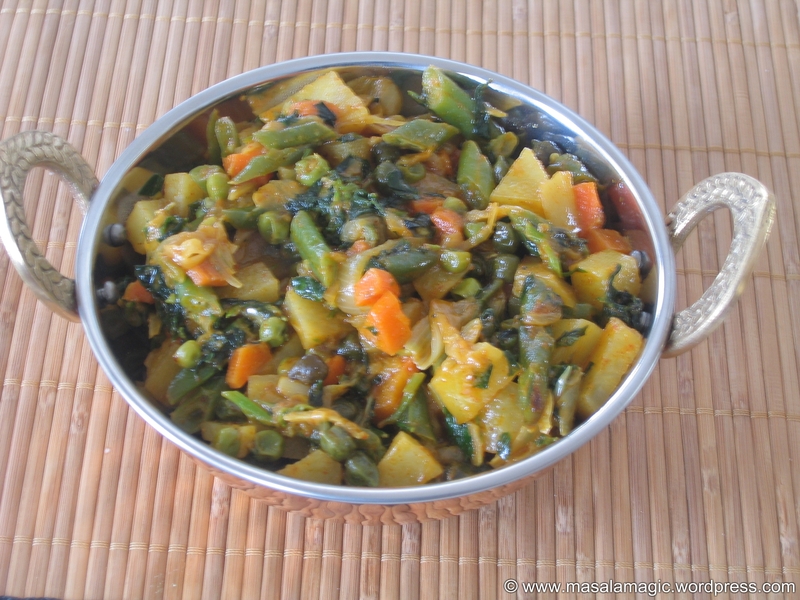 In a saucepan, add all vegetables except the methi leaves. Add plenty of water, a pinch of turmeric, salt to taste and boil until all vegetables are cooked. 2. Drain and keep the cooked vegetables aside. 3. In a pan, heat the oil. Add cumin seeds. Add the chopped onions and grated ginger and chopped garlic. Add the chopped methi leaves and and saute for 5 minutes. Add all the powders and mix well. 4. Add the boiled vegetables and about 1/2 cup water(you can save the drained water – in which you cooked the vegetables to use here). 5. Cook until well blended. 6. Garnish with chopped cilantro and serve hot.